Below is the full picece published in the Leinster Leader on 31st October. The article published in the Leader was an abridged version, which can be read by expanding the image to the left. Last February I wrote a piece for the Leader outlining the challenges facing Naas as a retail town and highlighting some of the projects that were underway to address those. Six months on some of those projects are beginning to come good and it an apt time to update on where it is all at. Changing technology, habits and lifestyles mean people shop and live differently now than they used. With it now being possible to buy a pint of milk in a garage or order a pizza from your iPad, people no longer need to “go up the street” on a daily basis. This challenge faces many towns around Ireland and at a recent meeting I held with Retail Excellence Ireland shopping habits were summed up succinctly as “midweek convenience, weekend experience”. In other words that people will shop online or in bulk midweek but want to enjoy leisure and recreation at weekends. We see this in Naas with the ever growing number of quality food and drink establishments throughout the town yet the town seems quiet midweek as people pull into out of town shopping centres, including the small convenience stores, that now exist in almost every suburb of the town and surrounds. And yet I believe the main street and town centre has a very strong future, and the number of new businesses opening, whilst sometimes drawing less coverage than those closing, is testament to that. I have been working on these issues since I was elected to the Council in 2014 and to the Dáil in 2016 and thankfully some of the key projects are now beginning to come good. I believe the New Year 2018 will see a lot of positive steps for Naas and hopefully the beginning of the turn in the tide. The headline news is that a big brand retailer is very hotly tipped to be heading for Naas Main Street – all the smart money is on Dunnes taking up residence in the old SuperQuinn site over the next couple of months. This would really fill a gap that exists in the supermarket and grocery trade and also mark a huge boost of confidence as well as footfall for the town centre. Whilst it is understood that the final details are still being worked out, very informed sources says it happening very soon. The unfinished shopping centre continues to represent the town’s tougher years but rapid progress has been made on that, even in the last few months, to move it from a stalemate situation to one where the receiver is now actively preparing the centre for sale by the end of this year. There is no shortage of interested buyers – I’ve met many of them – and the council have committed to taking the cranes down at the earliest opportunity – a change in the landscape that will be very symbolic. Exciting developments at Devoy Quarter, just behind the council offices and the Osprey hotel where a new innovation centre is to be developed; this is collaboration between University of Maynooth, the Kildare County Enterprise Office and the Kildare Chamber of Commerce. It will employ up to 200 people and provide hot-desking spaces and a start-up hub for new and growing businesses. Huge capital spending projects are underway which will reinforce the infrastructure of the town and district and equip it for growth now and in the years ahead. The Sallins bypass, the addition of a third lane to the M7 from Johnstown through to the M9 exit and the new motorway interchange with the Millenium ring road by the Kerry site will all see a massive boost to the road network. These will take through traffic off the streets of Naas, Sallins and Kill and allow locals to get around quicker and more easily. The new ring road for Naas has had budget approved and will complete the final leg of the journey around the town to ease pressure on the Dublin and Monread roads. It has also been agreed that this will be delivered in parallel with the Dublin road upgrade and cycle land projects, so as not to “put the cart before the horse” and make sure heavy traffic is diverted away from town. Parking is a bug-bear of many within the town; while there are a lot more spaces than sometimes realised, particularly when you consider the multi-storey on Wolfe Tone Street and the large council carpark off the Friary road, there can still be pressure for on-street parking spaces. The good news here is that Naas will take a step closer to being “clamp-free” when some of the privately owned clamping car parks move over to council management in the town’s new parking bye-laws shortly. Whilst it’s been controversial, the Poplar square redevelopment has got the go-ahead and this will create a new public plaza for events like the Midsummer festival, outdoor performances or just a place to sit and watch the world go and will give a very different feel to that end of the town. I was delighted to see Lawlor’s hotel get approval for expansion in the same square with 100 extra bed rooms and 100 extra car parking spaces all planned for a new business and conference centre there. Naas continues to offer the very best in terms of lifestyle and leisure options, between the ever growing popularity of the Naas Race, Naas GAA now the largest club outside Dublin, Rugby, Soccer, Golf, Tennis, Athletics, Boxing and Martial Arts Clubs all going strong with multiple options, not to mention two leading national race tracks, a cinema, theatre and musical society, Naas is spoilt for entertainment choices. The multitude of high end restaurants and bars has led to calls for a ‘Purple Flag’ award while the likes of Two Cooks in next-door Sallins recently received Michelin honours. There are any number of organisations working to revitalise and revamp the town, from the Lions to the Rotary club, from the Naas Regeneration Group to URBACT council initiative, and acknowledging the huge and ongoing work of the Naas Tidy Towns who recently secured another gold medal for the town and have a national first place finish in their sights as a realistic goal in the next few years. With the LEAP card now in action at Sallins & Naas rail station and trains direct right into the south city centre at Pearse, Tara and Grand Canal Dock, the area is now served similarly to a DART line. With the Naas Town Development Plan to be reviewed and enhanced over the next twelve months, planners continue to project Naas, as the county town, to lead the way as a population centre and the town is projected to grow to 50,000 population within the next 20 years. The new building sites and housing developments springing up all around the town are testament to this with strong sales and showings providing another vote of confidence in the town’s attractiveness and a bright future. 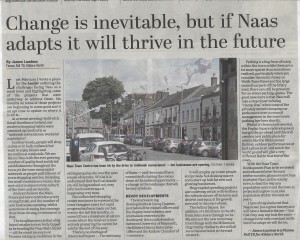 I have always believed that Naas town has a great history and will have a fantastic future – but that they may not look the same – change is the only constant in life but if we adapt we will thrive.